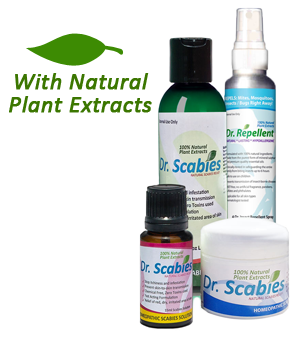 Dr. Scabies® products provide the best treatment regimen that is completely safe on the skin in treat scabies naturally. The main core of each product is SULFUR, a substance recognized, approved and officially monographed by the Homeopathic Pharmacopoiea of United States (HPUS). All the products of Dr. Scabies® have excellent standards on safety and efficacy of active ingredients. In ancient medicine, sulfur has long been used as powerful medicinal component for treating various ailments including scabies. And over the years, studies and researches have shown results that sulfur can eradicate scabies and other parasites. In choosing the best treatment for scabies, choose only the HIGHEST, SAFEST, PUREST and MOST NATURAL Sulfur formulation. Dr. Scabies® is used for symptomatic homeopathic topical treatment of scabies. Each treatment kit contains the following healing essentials: Dr. Scabies® Homeopathic Scabies Soap, Dr. Scabies® Homeopathic Scabies Solution and Dr. Scabies® Homeopathic Scabies Cream. These three products are formulated to work together in order to relieve itching, cure and prevent scabies transmission and occurrence altogether. Dr. Scabies® Homeopathic Scabies Soap is a deep cleansing head and body wash that combines natural sulphur with cedar leaf oil, green tea and cucumber extracts to effectively reduce the number of scabies eggs and mites on the superficial layer of the skin, halt the incessant itching, and reduce redness and inflammation associated with scabies. It has a delightful natural scent from plant extracts. It produces very light suds and does not contain harsh ingredients that chemically strip natural oils off the skin. Uses:Symptomatic homeopathic topical treatment of scabies. Use soap at least 1-2 times daily, for 7-10 days.If irritation or reaction occurs, discontinue use.Results may vary. Dr. Scabies® Homeopathic Scabies Solution is a thick dilution of sulfur and essential oils from sunflower, lemongrass and tea tree. It has a subtle scent from the blend of powerful botanicals. Diluting Dr. Scabies® Homeopathic Scabies Solution in bath water and soaking the affected area in it will create an insect-contact action that aids in eliminating the mites. It helps the skin recover from daily damages it receives from the mite’s activities. The solution helps create a barrier by coating the skin in protective oils thus preventing further infestation and lessening the chance of transmission. It can also be used as prophylaxis by people who were exposed to scabies and a relief for post-scabies symptoms. Uses: Symptomatic treatment of scabies. 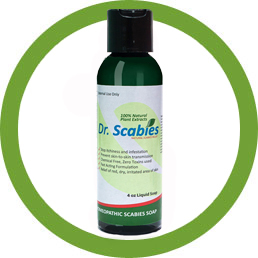 Add 15-20 drops of Dr. Scabies® Homeopathic Scabies Solution to bath water. Soak the entire body especially the affected areas (avoid the eyes and mouth) for 20 minutes and air dry. If irritation or reaction occurs, reduce application of product or discontinue use. Cymbopogon Nardus (Citronella) Oil, Helianthus Annuus (Sunflower) Oil, Melaleuca Alternifolia (Tea Tree) Oil. Dr. Scabies® Homeopathic Scabies Cream is compounded from Sulphur, vitamin E and plants with scabicidal properties such as chamomile, sesame, soy bean and palm into a very soft, white, creamy consistency with a hint of natural and refreshing scent from the plant oils and extracts. It has a strength that is more than sufficient to penetrate and melt the extrinsic body structure of scabies mites and eggs. Dr. Scabies® Homeopathic Scabies Cream is recommended for mild to extensive cases, disinfecting and healing wounds and lesions caused by mites. It is very effective in treating secondary bacterial infection which is a common complication of scabies infestation. Cleanse skin thoroughly before applying. Cover the affected skin with cream one time per day. If excessive drying of the skin or rash occurs, reduce the application of product or discontinue use. 1.Take a shower (cold/lukewarm/warm water) using Dr. Scabies® Homeopathic Scabies Soap 1-2 times daily. Avoid hot water to prevent the itch from aggravating. For children, keep the water at body temperature 98°F (37°C). Work the soap into a lather from head to toe. Make sure all the affected areas are covered, leave it on for 5-10 minutes. Rinse off the soap suds. 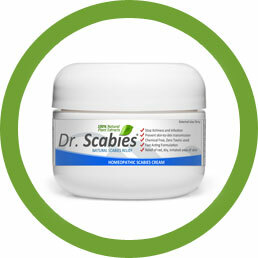 2.After taking a shower, add 15-20 drops of Dr. Scabies® Homeopathic Scabies Solution to bath water (1-2 times daily). Soak the entire body especially the affected areas for 20 minutes and air dry.Sponge bath is an alternative to tub bathing. Fill up a bucket or basin with water and add 15-20 drops of solution. Use a washcloth or sponge to bring up the water to the rest of the body. Discard or wash the sponge/cloth with soap and hot water after use. Avoid the eyes and mouth. 3.For spot treatment, apply Dr. Scabies® Homeopathic Scabies Cream 2-3 times a day (or as necessary) on every square inch of affected skin. Include the posterior ear folds, intergluteal cleft, umbilicus, skin folds, palms and soles, forehead, temples and scalp. Pay close attention to the areas beneath the nail plates and fingertips. Do not get the cream near the eyes or mouth. If excessive drying of the skin occurs, reduce the application of product or discontinue use. 4.Each treatment with Dr. Scabies® should be followed by hot-wash laundering or dry cleaning of sheets and pillow cases and any clothes worn against the skin over the last week. Non-washable items should be sealed in a plastic bag and stored above 20° C for one week. Alternatively they can be frozen below -20° C for 12 hours. Rooms should be thoroughly cleaned with normal household products. Fumigation or specialized cleaning is not required. Carpeted floors and upholstered furniture should be vacuumed and all areas cleaned with normal household products. The vacuum bag should then be discarded and furniture covered by plastic or a sheet during treatment and for 10-15 days. 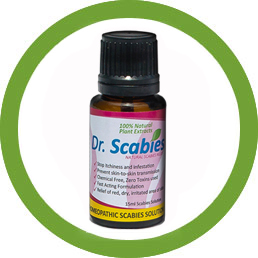 Dr. Scabies® Homeopathic Scabies Solution can also function as repellent and furniture spray. It naturally repels and kills scabies mites to prevent further transmission. Preparation: Depending on the capacity of spray bottle, add 15-20 drops of solution to 250/500/750 ml (8-25 oz.) of water. Spray on the skin, clothes, tables, chairs, carpets, rugs and other surfaces that came in contact with the infected person for added protection. 5.Repeat the entire steps for 7-14 days until scabies is treated. Severe cases may take longer time to get treated. Avoid skipping any of the steps or missing a day. 6.Family contacts with potential exposure to scabies should use Dr. Scabies® Homeopathic Scabies Soap as prophylaxis and must be directed to observe their skin daily until 6 weeks past the date of last potential exposure. 1.After bathing, the skin should still feel silky or slightly oily. The medication on the skin will counter any itchy feeling and repel scabies mites to prevent further infestation. 2.Dr. Scabies® Homeopathic Scabies Soap may also be used as hand wash soap for all family members. 3.Finger nails and toe nails must be clipped before applying the Dr. Scabies® Homeopathic Scabies Cream under the nails and in between the fingers and toes if affected. 4.Reapply if the cream is washed off during hand washing, toileting or performing perineal care. We have conducted our own testing by documenting the healing progress of 1000 people all over New York treated with Dr. Scabies® Homeopathic Scabies Soap, concentrated solution and cream. All three products were used consecutively and repeated in 4 – 15 days until they were cured. The patient’s clothing including bed linens were disinfected and washed in the hot cycle of the washing machine and dried in the hot cycle of the dryer for 10-20 minutes as well. Out of the 1000 cases, 97% showed complete cure within 4-15 days. Among that 97% population, 94% who had localized lesions and mild to moderate infestation healed within 4-7 days. The rest of the 97% were categorized as moderate to severe cases with secondary infection and have lesions widely-spread on the hands, feet, and torso were treated longer. It took them 8-15 days to be completely cured. However, 3% of the 1000 cases failed not because the treatment regimen lacked strength or effectiveness but due to patients who either defaulted (did not report back or were not been able to contact by their treatment partners) or skipped the daily application of the treatment. Scabies can be completely cured in as fast as 3 days! It can even cure the re-treatment cases in which the patients were failed to be cured by permethrin products. Based on the data of patients who used c cases diagnosed during the early stage with few spots or patches of rash will take about a week of intensive effort of treatment and vigilant follow up. Cases with established infestations wherein rashes are rapidly progressing on the body for a few weeks already will take at least two weeks of close monitoring and rigorous Dr. Scabies® treatment. TREAT EVERY MEMBER OF YOUR HOUSEHOLD! Scabies rapidly spreads from one person to another when all conditions are met *(varies from person to person) . It may take one week to two months from the first infection to develop and symptoms appear on the infected person. All household members need to be treated with Dr. Scabies® for actual treatment or prophylactic purposes whether they are experiencing itch or not. In order to determine how much Dr. Scabies® products will be consumed by the whole family during the entire duration of treatment course, take the per person recommended amounts of treatment ingredients and multiply them out. For children about half the size of an adult, apportion ½ of the amounts of adult dosage. For babies, prepare proportionally smaller baths using smaller amounts of liquid soap, concentrate and cream. Dr. Scabies® created special packages for Family Size Treatment depending on the number of people in the household. Dr. Scabies® are available and accessible to all people worldwide that need treatment. Fast delivery options available for All U.S. and International orders. NOTE: Start treatment following proper diagnosis of scabies and as soon as spots appear. 1 bottle of Dr. Scabies® Homeopathic Scabies Soap x 3 oz. 2 jars of Dr. Scabies® Homeopathic Scabies Cream x 2 oz. NOTE: May use more than 2 grams per application depending on the extensiveness of affected areas. Insects that are classified as pests can invade or affect our health, livestock, plants and pets in numerous ways. They swarm and fly in every part of the globe and are distinctly highly-populated and have thousands of varieties. Statistics show that as much as ten percent of the food man produces is consumed by insects. In addition to being annoying, insects transmit innumerable diseases that significantly contributed to human morbidity and mortality. These insect-borne diseases such as Lyme disease carried by ticks and West Nile virus carried by mosquitoes, triggered worldwide threats which clearly emphasized an ever increasing need for an environmentally friendly insect repellent, which is effective to repel insects. Numerous variety of repellents were sold in the market over the years to combat harmful insects. Most of these products contain hazardous chemicals. Repellents using Permethrin, Picaridin, IR3535, or 3-[N-Butyl-N- acetyl]-aminopropionic acid, ethyl ester, and DEET (N,N-Diethyl-meta-toluamide) as base may offer the longest protection from insect pests. However, the actual harm from using these products outweighs the beneficial effects. These types of repellents are not perfect nor the only choices. In the past, regulating toxic compounds for pest control was lenient. That is no longer the case because U.S. Environmental Agency (EPA) is now strictly regulating the use of these products. Most insect repellents that are registered with EPA have warnings to prohibit their use near food or in food-serving places and in waters bearing fish, or that they cannot be applied to children. The Food & Drug Administration (FDA) has a classification known as “GRAS,” which designates “Generally Regarded As Safe” compounds. Certain essential oils follow into the GRAS category. People are constantly looking for safer alternatives that offers safety, reliability and prolonged complete protection from flying, biting and sucking insects. It can, therefore, be appreciated that there is an ever growing market demand for environmentally safe insect repellents that actually effectively work to repel insects. As a response to this demand, another type of insect repellents and pesticides were released in the market and those were classified as “natural” or “green”. Dr. Repellent® is a proprietary blend of Sulphur and Pure Essential Oils that are considered botanical repellent and insecticide. Dr. Repellent® carefully handpicked the ingredients to create a synergistic mixture, thus enhancing its effectiveness, providing full protection up to three hours. The existing natural insect repellents in the market are just usually a combination of 3-5 natural ingredients such as essential oils. Essential oils are derived from the leaves, stems, flowers, or twigs of plants, and usually acquire the odor or flavor of the plant after the process of extraction. Many of these essential oils have insect repellent and insecticidal capabilities. The use of essential oils and sulphur as repellent and insecticide even dates back from thousands of years ago. A formula consisting of a single essential oil can only create a very weak repellent. Amalgamating essential oils together creates a synergistic effect, as opposed to an additive effect. In accordance with this statement, using three essential oils together can be 10 to 15 times stronger than a repellent with only one essential oil. The use of 7 essential oils together can achieve a strength that is 15–30 times as strong as using just a single essential oil, enhanced with the power of sulphur. They remove or ward off insects very quickly. The natural scent of the oil calms, refreshes and relieves the body. It is non-toxic and environmentally friendly. It is very easy to apply on body, clothing and other surfaces. Many oil based insect repellents serve the dual purpose of sunscreen to protect them from sun and insect at the same time. There is no doubt that essential oils are very concentrated and potent compounds. Literally, there hundreds of obtainable essential oils but not all of them can be utilized due to its toxicity and sensitizing effects and even more so combining them together. Some essential oils possess antagonistic effect when combined to another essential oil. Others do not have insect repellent/insecticidal capabilities. Dr. Repellent® has combined not just one but eight naturally sourced ingredients with repellent and insecticidal properties – against flying, biting and sucking insects. This is the only repellent that contains Sulphur which is one of the oldest known natural pesticides. It is also the preferred natural treatment against the highly-contagious disease called Scabies. It does not elicit scabies mite resistance and completely safe to use on children and relapse cases of scabies. Some of the essential oils that Dr. Repellent® contains such as cedar, citronella and lemongrass, when used in their pure and undiluted form can cause irritation. In order to prevent this side effect, the sensitizing properties are neutralized by rosemary, sunflower and tea tree oils. Dr. Repellent® constitutes potent ingredients so it is prepared and diluted to certain levels suitable for all skin types. Generally, Dr. Repellent® is well tolerated by the skin, rapid-acting, non-toxic, perspiration-resistant and has fresh, clean scent. Moreover, Dr. Repellent® has a broad spectrum of activity (i.e. should repel/kill as many harmful and annoying insects as possible) and the protection of the treated skin areas/ clothing/surfaces is to last up to three hours or the longest possible period of time. Dr. Repellent® has dual effect on insects. Insects breathe by means of tubes that open at the body surface in spiracles. Internally, these tubes divide into very fine branches leading to the internal vital organs. These spiracles are water repellent, but oil may enter them. Accordingly, the type of oils Dr. Repellent® has can enter the spiracles and damage the internal organs, so the insects will be killed or at least repelled. As Repellent – it causes an insect to be turned away or warded off. Repellents are necessarily milder and are intended merely to “turn away” or “repel” insects. Contact Poison/Nerve toxins- Dr. Repellent® enters the body of insects via their epidermis upon contact and causes death by poisoning insects by mimicking the neurotransmitter acetylcholine and causing overstimulation of nerve synapses. Dr. Repellent® is powerful against insects but has very low, negligible dermal (skin) toxicities so it is considered non-toxic for human use. Stomach Poison/Anti-feedant – Dr. Repellent® has sulphur, plant and petroleum derived (mineral) oils that are highly-effective against small, soft-bodied insects and mites that are immobile or slow-moving. These ingredients enter the body of insects via their mouthpart and clog the insect’s breathing holes (spiracles) so they suffocate and may affect their digestive system. The insects are immediately paralyzed or stopped from feeding, although death may occur hours or days later. Essential oils also prevent gas exchange through egg membranes, so eggs are often targets of control with oils. The fatty acids in plant oils may disrupt cell membranes and interfere with normal metabolism. For more information on the ingredient, check Dr. Repellent Ingredient Profile. Dr. Repellent® has carefully considered the most suitable type and formulation according to target insect pest and purpose. Another significant factor which plays an important role in repelling/killing that must be considered is the application method. Dr. Repellent® believes it should be applied suitably by spraying and making use of lightweight, convenient, weather-resistant and recyclable spray pumps for metered dispensing from non-pressurized containers. It is very easy and functional for indoor and outdoor use in preventing bites from annoying insect pests. Residual spraying is applying Repellent® on surfaces such as skin, clothes and furniture which may come in contact with insect pests or where there are ongoing pest activities already. It is mainly used to repel flying insects or those staying on an object surface for a long period of time, e.g. cockroaches, fleas, ticks and ants. Space spraying is applying Dr. Repellent® by releasing it from a pump sprayer, forming small droplets that float in the air or settle on object surfaces with which the passing insects will come into contact or over the space where there are pest activities. It is also used to combat flying insects like mosquitoes, flies and wasps. Shake well before each use. Spray directly on entire area of skin to be protected. Reapply as needed. For sensitive skin, apply a small amount of the product to test before full use. Keep out of eyes and keep off broken or unhealthy skin. Adult supervision is recommended when using this product on children. Remember to shake vigorously before application for full protection, and re-apply as needed. For best results apply liberally to exposed skin, especially your ankles, legs, arms and hairline. Re-apply every 2-3 hours, or more often as needed. For added protection apply to clothing and surroundings. Note that Dr. Repellent® contains essential oils that and inherently fragrant and potent although they are naturally-derived. The essential oils are diluted within safety levels suitable for repelling/killing harmful insects. Although Sulphur and essential oils are beneficial to any age population, special considerations must be still given to elderly and children. There may be a higher incidence of health problems among older people so it is imperative to check the profiles of each ingredient to ascertain that it is not contraindicated for a particular health problem and there are no contraindications with certain medications. People who are predisposed to allergic reactions to fragrances and certain substances generally have sensitive skin and are more inclined to get irritated. Since people are different from one another, it is difficult to predict whether a specific ingredient will cause dermal sensitization even when an individual has never exhibited allergies before. Therefore, a skin test must be performed before using over a larger area. Spray a small amount of Dr. Repellent® on the wrist or elbow and leave it uncovered for 24 hours. This area must not be washed during the entire period. If there is no sign of itching, redness or swelling within the given period of time then it is safe to use. While staining is unlikely, it is recommended to test for possible staining on an inconspicuous area on surfaces to be sprayed. Similarly, it is very important to test a small application on children before using over a larger area of the skin. Apply just enough Dr. Repellent® to cover the child’s clothing and exposed skin because applying more of the product does not make it more effective. Reapply after 2-3 hours or as necessary. Application of Dr. Repellent® on young children needs adult supervision. Wash children’s skin with soap and water to remove any residues of Dr. Repellent® when they return indoors. Never apply Dr. Repellent® to children younger than 2 months without proper medical advice. Never spray Dr. Repellent® directly onto the child’s face. The proper way of doing it is to spray a little on the adult’s clean hands and then rub it on the child’s face. Do not spray insect repellent on cuts, wounds, or irritated skin. If a child is having a reaction to Dr. Repellent® manifested by redness and rash, stop using the product and wash the child’s skin with soap and water. Then call the child’s pediatrician for help. Bring Dr. Repellent® container along to the hospital or pediatrician’s clinic. Keep Dr. Repellent® in a safe place where it is out of children’s reach. Make sure it is a cool, dark place to prevent the essential oils from oxidizing which may alter effectiveness. For Treatment or Protection Around Beds: Spray Dr. Repellent® around the headboard, footboard and base/legs of bed, particularly in the cracks/crevices. Extend the protection by spraying it around the bedside tables, wall hangings and along the floorboard adjacent to the bed. Finally, spray around the location where your clothes are kept. Repeat as necessary. Dr. Repellent® encourages good safety practices when using it. If irritation persists, contact a physician.Dr. Repellent® is generally non-toxic but itmay enter the body via eye contact, skin contact, ingestion and inhalation. Eye contact may cause irritation. Avoid eye contact with product. If irritation is noted, immediately flush eyes with a directed stream of water for at least 15 minutes while forcibly holding eyelids apart to ensure complete irrigation of all eye and lid tissue. Get immediate medical attention if irritation occurs. Skin contact may cause irritation. In case of skin irritation, wash with soap and water and discontinue use. If clothing is penetrated, immediately remove clothing and flush skin with water. Wash clothes before reuse. Get immediate medical attention if irritation occurs. Swallowing may cause irritation of mouth and throat. It may also cause nausea. Do not taste or swallow product. Do not induce vomiting. If spontaneous vomiting is inevitable, prevent aspiration by keeping victim’s head below the knees. Get immediate medical attention if ingestion occurs. Remove to fresh air. If breathing is difficult, have trained person administer oxygen. If respiration stops, have trained person administer mouth-to-mouth resuscitation. Get immediate medical attention if irritation occurs. Keep from freezing. Store this product below 120º F (40º C), preferably below 75º F. (24º C), in a cool, dry, well-ventilated area away from heat, sparks, flames, oxides and out of direct sunlight. Offer for recycling if available or discard in trash.